Torsten Langguth, Dr Schneider Automotive Systems Inc.
Dr. Schneider Automotive Systems Inc. was very pleased with the Epoxy job done at our 59,000 sq ft manufacturing floor here in Russell Springs, KY. The Bowles team was very professional and finished the job right on time. We had a tough schedule but Bowles helped us to overcome a major issue caused by another contractor right before all our equipment got delivered. Everybody who comes in for visit is amazed by the quality and the look of our new Epoxy floor. This makes a big difference for customers and employees who enjoy this great environment. It looks bright, friendly and clean. Bowles worked with great equipment and the whole team worked very professional. They could answer all our questions and requested changes were done quickly as agreed. The price is reasonable and the quoting process was done with light speed. Dr. Schneider Automotive Systems Inc. would always recommend David Smith and his team for every paint job. As a matter of fact we are planning on a building extension soon, Bowles will be our first choice when it comes to floor, wall and exterior paint. I want to let you know what a great jobs your guys did on the fence and gate. I really appreciate the care they gave to prevent damage from overspray to the brick and their overall professionalism. I will be recommending your company to others. 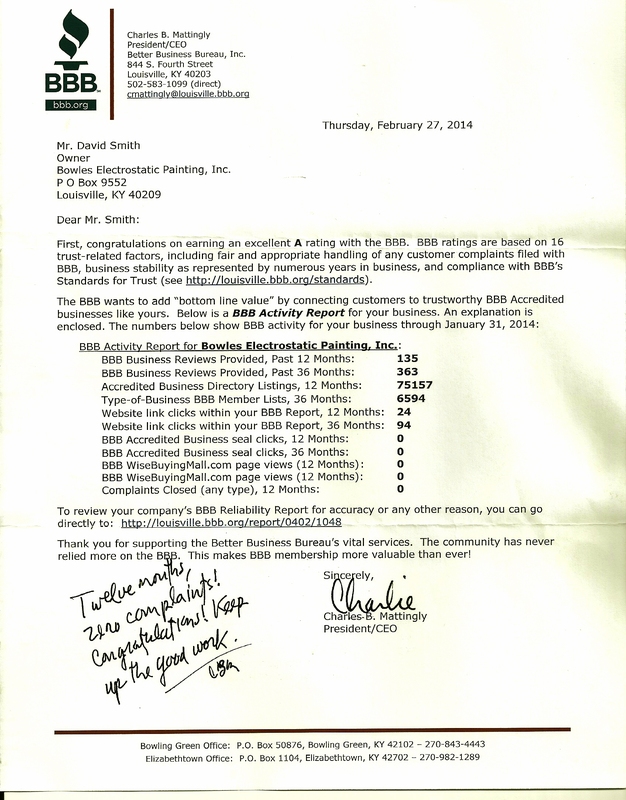 This letter is to inform any of its readers about the work that Bowles Electrostatic Painting performed at our 1 million square foot facility. July 2013, Bowles came into our with a huge task at hand, re-striping our walkways in our plant. As the Industrial Engineer for our automotive manufacturing plant this seemed like a very complicated and complex task especially considering our plant never sleeps and our biggest contract at the moment is Ford. David Smith, the owner took a tour of the plant saw that we have over two miles of lines to paint and confidently said “No problem, we can paint this in the allotted time frame.” Five days was their schedule to bead blast and grind the previous lines, layout the new lines, and paint two coats. Days before Bowles started the actual schedule, David came in and tested various products on the floor to insure we were getting what fit us the best. I am proud to say the that David was very professional, on time and completed his schedule according to his word, and did a fabulous job on the paint striping. I would 110 % recommend this company for any painting job inside or outside. In fact we have scheduled them for more work here because David and his team have such a keen expertise in painting we felt that no one else could outperform them. In all the years this building has been here (1988) I don’t think we have seen such quality and professionalism as Bowles Electrostatic Painting. Justin was right on time and had his work cut out for him. The tub had been reglazed 10 years prior by a different company. The glaze came off within months so it had been peeling for years. He had it stripped and looking fine in a matter of hours. The finish looks like new again; we are very happy with their work and plan to use them again on another job. This is the second rental house that they have done for me and it looks great. They were booked about a week out. They came on time. Did a great prep job on a 1920’s bath tub and electrostatic painted it. The guy that came out was very nice, did a great job and cleaned up. They gave me their January discount, 259.00 was a good price for their quality work. I have use Bowles in the past and was pleased with them. Several years ago, I hired a company to re-paint a bath tub. The paint did not hold up and after a couple of years, it pealed. Bowles came to the rescue and removed old paint and refinished it with “electrostatic” method and it still looks great. I really like this company, they provide a good service, and I know it will hold up well. On December 19th 2012 Bowles Electrostatic Painting arrived at our plant to begin the prep-work for the next two days of painting. Their crew worked long hours to complete the project within the available time and at the end of the project they had painted almost 4000 linear feet of walkways (mostly dashed lines) and placed several “stop” indicators at key intersections. The crew was courteous and professional and I look forward to working with them in the future. We have used Bowles Electrostatic Painting for over 15 years and they are always very professional and thorough in their work. Always start and complete their jobs on time and do excellent work. They have painted machinery, pipes , buildings and done many other projects for us. I would highly recommend them to anyone. My Name is Dan Orr and I work for Johnson Controls in Louisville, KY. We have contracted Bowles Electrostatic Painting for Industrial Floor Coatings and Warehouse Striping over the last 5 years and can say without a doubt that we are totally pleased with the quality of work they do. They are always punctual and friendly and do top-notched work.